Mothers Day in the UK is celebrated with great excitement and verve but it does not fall on the same date as in the US. In the UK, Mother's Day celebrations take place on the fourth Sunday in the month of Lent. Since the Lent days are not fixed, the date for mothers Day changes every year. Mothers Day came to be celebrated in the UK in 17th century as Mothering Sunday, much before the custom began in US. Today, the traditional festival of Mothering Sunday is more commonly called as Mothers Day in England and is celebrated in much the same way as it is celebrated in US. On this day children give flowers and bouquets to their mother to express their love for them. The tradition of celebrating Mothers Day began much earlier in England than it started in the USA. In fact, England was the first country in the world to dedicate a day for mothers as early as the 1600s. They called this day for mothers as 'Mothering Sunday'. The festival has its roots in the practice wherein poor people in England send their little children to work as domestic servants or apprentice with the rich. At that time it was considered important by the people that these children, staying away from their families be allowed to visit their homes once in a year. The time decided for the annual visit to home was middle Sunday of the fasting period of Lent (which lasts from Ash Wednesday to Easter). For this reason, the day was called 'Refreshment Sunday' or 'Mid-Lent Sunday'. In England the day dedicated for mothers was more commonly called Mothering Sunday as people, mainly children visited their 'Mother Church' or the church of their home and not the 'Daughter Church', the closest church in the vicinity. After paying a visit to church, children met their mothers and presented them flowers, which they gathered from bushes along the way. Girls baked special cakes called 'Simnel Cakes' for their mothers. The tradition of Mothering Sunday stopped with the advent of Industrial Revolution in England when the working conditions and life pattern changed. 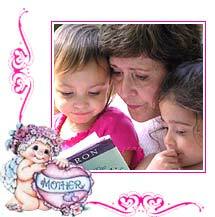 Over the period of time one Sunday - 4th Sunday in Lent (3 weeks before Easter) was reserved in the honor of mothers. In the present time, original meaning of Mothering Sunday has been lost and has taken the form and name of Mothers Day in US.